Falls on January 14th of every year with the festivity starting a day before and ending a day later – a three – day fete! During the first day bonfires are lit and people warm themselves around the ‘Bhogimantalu’. The next day is the harvest festival followed by a more sombre celebration that ends up with cattle being decorated and taken in processions. In urban areas, kites are flown. Ugadi is the Telugu New Year falling sometime during March and April depending on the Telugu calendar – first day of the month of Chaitra. The day starts with an early morning ritual after bathing – tasting a syrupy preparation of raw mango pieces, jaggery, tamarind, margosa (neem) flower, salt and a little bit of chilli powder denoting the five tastes of sour, sweet, bitter, salt, and chilli. On this day, priests and astrologers render “Panchanga Sravanam” – a reading of the almanac to narrate to the people what the stars foretell. A major Hindu festival that is observed for 10 days. Vijaya Dasami or the tenth day of victory symbolizing the destruction of the demon Mahishasura by Goddess Durga follows ‘Navaratri’ or nine nights of the festival. During this festival the triumvirate of Durga, Lakshmi and Saraswati are worshipped. Children help womenfolk display dolls in the household. Vijaya Dasami or Dasara symbolizes victory of virtue over vice. During the festival artisans and workers worship the tools of their trade, seeking prosperity. The ‘festival of lights’ usually occurs in October or November. It has come to be associated with the bursting of crackers and worship of the Goddess of wealth-Lakshmi. The business community does no transactions but opens new accounts on the day .A major festival all over the country Lord Krishna celebrates it to commemorate destruction of the demon Narakasura. Another auspicious day for Hindus, wherein Shiva is worshipped and people keep awake the whole night in prayer and fasting. Lakhs of devotees line up at the numerous Shiva temple of the State. Holi is the festival colours. In the urban areas of the State, young and old alike indulge in a riot of colours, smearing colour on each other’s faces or dousing each other with coloured water. In some area, effigies of the God of lust are burnt in public bonfires. The holiest month for Muslims observed as thanksgiving to God for general well being. Most of the Muslims observe a fast from down to dusk for the entire month. The fasting, during which even water is not consumed, cleanses and rejuvenates all the systems in the body. The fast (Roza) is broken every evening after prayers (Namaaz). Often dates and fruits are consumed to break the fast. In Hyderabad, restaurants prepare ‘Haleem’ during Ramzan months, a Moghalai specially made of mutton, which is served after sunset. The final day of Ramzan is celebrated with prayers at various Idgahs, festivities and exchange of greetings. It symbolizes the day Prophet Ibrahim submitted himself to the will of God. To symbolize the extreme sacrifice, Muslims sacrifice lambs and sheep or goats. Portions of the meat are given away to other families and to the poor. Christmas is the main festival celebrated by the Christian community, considered the third largest in the State. In fact, a large number of non-Christians too join in the celebrations that commence on Christmas Eve (December 24th) and continue throughout the next day. The day Gautama the Buddha was born in Lumbini, his enlightenment and Nirvana are celebrated. Special prayers and programmes are held at Hyderabad, especially near the Buddha Statue in Hussain Sagar and the Buddha poornima project alongside. International Kite Festival at Shilparaman, Madhapur, Hyderabad held in 14-16 January. With kites of all shapes, size and colours, people take part in this gala event and compete with international kite flying champions, flying the skies of Hyderabad with high flying colours. All India Arts and Crafts Festival at Shilparamam, Madhapur, Hyderabad held in 1-15 March. AP Tourism has been organizing Annual Art and crafts Melas to breathe life into dying art forms. During these melas craftspersons from across the country come to display their exclusive creations. Buyers come and pick up objects d’art directly from the makers with out having to deal with middlemen. Hyderabad Festival at Quth Shahi Tombs, Hyderabad held in second Friday, Saturday & Sunday month of April. This festival brings the choicest talents from the fields of music, Dance and Theatre. Ghazals, Mushairs, Qawwalis, Classical Dance and music, reverberate in the air of Hyderabad. The Deccan festival essentially mirrors the glorious Quib Shahi epoch. Lumbini Festival at Hyderabad / Nagarjunasagar held in 28-30 April or at the time of Buddha Poornima in every year. Hyderabad, the capital city of Andhra Pradesh hosts the biggest monolithic Buddha statue. And Nagarjuna Sagar is the place that abounds with historic uniqueness and amazes with modernity. Conducted in these two places, this festival tries to retell the unforgettable yore of age-old Buddhist heritage. With exclusive cultural Programmes and enchanting dances, the Festival attracts tourists and Buddhists from all over the world. The places echo with the messages of the Buddha and Acharya Nagarjuna. The Vijayanagar Festival at Chadragiri held in the third Friday, Saturday and Sunday of the month October. The historic Chandragiri fort, near Tirupati, (where a Sound & Light Show is held daily) stands testimony to the grandeur of the Vijayanagar rulers. The festival coincides with the annual Brahmotsavam at the Tirumala temple. The visitor who witness the most reputed musicians and dancers perform embark on a journey into the past. Through the Rayalaseema Food Festival which is also held at the same time, the most traditional delicacies of the region are brought forth exclusively for the gourmet’s delight. Visakha Utsav & Rishikonda Beach Festival at Vishakhapatnam held in month of 22nd to 25th December. On the golden beaches of Vishakhapatnam, this festival brings an inimitable blend of folk and classical dances and music. At this Festival, the people are in for a treat at the Craft Bazaars, Exhibition Stalls and Food Courts. All India Girijan Festival and Artists’ Camp at Araku Valley and Borra Caves held in the second Friday, Saturday & Sunday of the month of November. Through this festival, A.P. 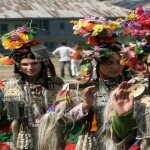 Tourism brings forth the spellbinding talents of the Girijans and the Tribes. In the picturesque valley of Araku, A.P Tourism showcases the crafts of the tribes who create magic with their hands. The folk festival of Bonalu in the Telangana region brings with it celebrations which see the colourfully dressed female dancers balancing pots (Bonalu), step to the rhythmic beats and tunes in praise of the village deity Mahankali. Male dancers called Potharajus precede the female dancers to the templelashing whips and neem leaves adding colour to the festivity. This entry was posted in Andhra Pradesh, Andhra Pradesh Fair & Festival and tagged baisakhi, Fair & Festival, indian festival list, indian festivals list, list of indian festivals. Bookmark the permalink.